The best thing about this consistently warm temperature is that it makes packing a breeze. Here's what you'll need. In general, Florida is a very laid-back state. There's no need to "dress up” to visit most restaurants in the area. 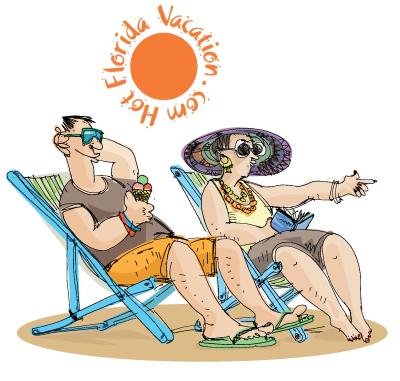 Casual attire is acceptable at all Tampa area beach restaurants. You will want to bring light breathable tops that take advantage of the cooling breezes. Most people think of short sleeve shirts however, consider bringing loose long sleeve shirts instead. One of St. Pete Beach’s largest running races, The St. Pete Beach Classic, gives out long sleeve technical shirts instead of short sleeve cotton shirts for this very reason. A cool material and long sleeves will protect you from the sun better than sunblock. Shorts are generally acceptable in most beach restaurants. People understand that you are on vacation. It's generally advisable to pack light quick drying shorts rather than cotton cargo shorts with lots of pockets that take time to dry. You will want two bathing suits. One for your most extreme casual wear around the pool deck and at a beach bar and another for water sport activities and lounging on the beach. 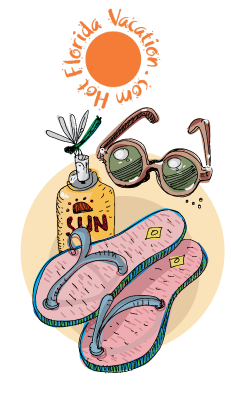 Of course flip-flops are a must however, if you can't find a good pair at home, flip-flops are a staple of the most drug stores and grocery stores in the area. Ladies you might want to bring some comfortable flats or sandals. Guys, think about boat shoes or something you don't mind getting a little sand in. A big floppy hat with a large brim is a must. Most grocery stores, and convenience stores, and a T-shirt shops in Florida sell the perfect hat. Most to travel blogs will tell you to bring sunblock. I disagree. For one, there is nothing worse than your brand new tube of sunblock exploding all over your clothes and your suitcase. You will find more variety in sunblock choices in Florida then you will find in most other states in the country. Get your sunblock here. Use the whole tube while you're here and toss it when you're done. Check out our #1 Tool for Vacation Planning article.